How to get ts2 up and running! Pixelated Puddings Sims Chat Game Optimisation [TS2] How to get ts2 up and running! [TS2] How to get ts2 up and running! game install, whether through disks or the UC collection on origin. If you're using disks you will need the Securom Removal Tool but the UC collection has it scrubbed from its files with an update from Origin. Sims 2 nocd hack, while supposedly not required, your game will have an error and crash if you don't use this. Don't worry if it gets flagged as a virus, something about the exe reaaaally upsets security stuff. If you're worried, I will send you mine. The Sims 2 Graphics Rules Maker - this thing is amazing. It automatically detects your hardware and will write a new graphicsrules for you. We'll go over how to use this soon. Step one: install your game as you normally would. Cut the NOCD exe and paste it in here. Tell your computer you really mean it when it complains, because it doesn't like alterations made in program files. So the normal game path already there, a space and then -w for windowed mode. To launch it in a specific resolution -w (and another space), add the option -r<resolution>... for example, -r800x600 or -r1024x768 or -r1280x1024. Your game should launch without any issues. I'll go over the 4GB patch and reshade next, plus bodyshop and cc/mods. Tip#1: Make sure to check that your Graphics Card is listed in the Video Cards.sgr files in your Sims 2 installation folder! If not, use the Graphics Rules Maker , add your GPU to the list and double-check that it HAS been added there (I had problems with this and had to do it manually in the end!). Make sure to copy the new Graphics Rules AND Video Cards files to both folders in the installation location (Config and CSConfig). Tip #4: Especially if you are playing on Windows 10, make sure to do the Memory Allocation Fix that Jessa shows in the video above! You NEED this! This fix also helps Windows 7 users!! Tip #5: (Not sure if this is necessary after applying #4, but I did it before I fixed the memory leak issue and didn’t have any crashes after that either) Make sure your Virtual Memory amount is set high enough in Control Panel > System > Advanced settings > Advanced tab > Performance settings > Advanced > Virtual Memory. Set the custom amount for your main drive to be 25,000-30,000 and click “Set”. I’m listing here all the tricks I did both for you guys and for myself aswell, in case I need to go through this whole thing again at some point in the future (after switching Graphics Cards, which thankfully won’t happen in a few years!). Hopefully it’ll be useful and helpful for you guys! Special thanks to Jessa, Gina and everyone on Leefish forums for all the useful information and tips on how to fix the graphical problems! Now, on to more Sims 2 livestreams!!! Tip#6: Use “boolProp UseShaders false” to stop the flashing (I’ve added this to my userStartup.cheat file so it will stay on automaticly, especially since I have certain neighborhoods that will always flash pink in the neighborhood view… *cough* Clayfield *cough). Tip#7: Delete the game thumbnails from your Documents > EA Games > The Sims 2 > Thumbnails. ——– If you start getting the flashing pink glitch while playing on a lot (can happen especially if you’ve been running the game for a long time), save and exit the game and delete all thumbnails before restarting the game. I delete the thumbnails almost every time before I load up the game, just to be sure. Tip#8: Change your settings in-game to match the ones shown in the video above! (Shadows: off, Lighting: medium, view distance: medium) This will help prevent any further issues. For now reshade seems to be broken because of an origin update. 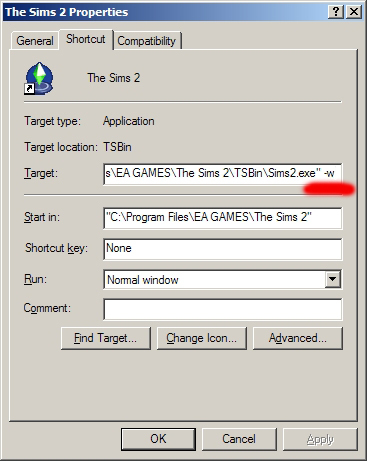 (08-11-2018, 10:50 AM)acquiresimoleons Wrote: [*]Sims 2 nocd hack, while supposedly not required, your game will have an error and crash if you don't use this. Don't worry if it gets flagged as a virus, something about the exe reaaaally upsets security stuff. If you're worried, I will send you mine. I mean it will crash xD it might not crash right away, but it WILL crash. The noCD hack is essential. Thank you! One day... I will do this! Thanks for all this! I have my game up and running just fine but I'll be coming back here when I inevitably have to get a PC with Windows 10.